Deanna's Corner » Blog Archive » Moving Day! We finally did it! The Webmaster and I moved… from one end of the house to the other. While this doesn’t look nearly as complete as it will eventually, it’s a huge start. We have lived in this house for 16 years, and been in one room the whole time. As such, we had a bred a fine crop of dust bunnies under our bed, behind the dressers, in nooks and crannies… yeah, it was a dust bowl. Grandma and Gichan came over to help, and once the new room was emptied of all the stuff that we had stashed in there temporarily, the move-in began in earnest. Bed first, then nightstands. Dressers followed later. 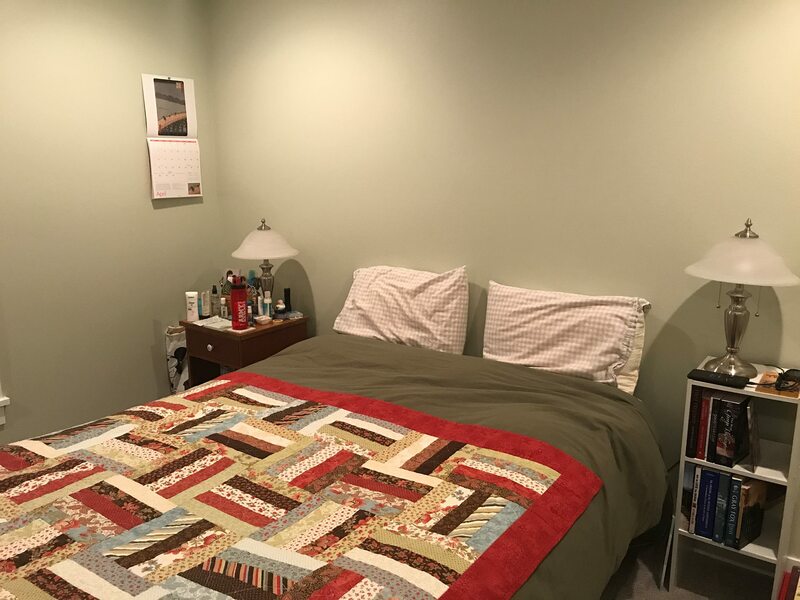 And while the old master bedroom is a hot mess (which must get shaped up immediately for Thumper’s therapy work), we’re now getting used to the new digs. Pretty exciting stuff! This entry was posted on Monday, April 15th, 2019 at 12:20 am	and is filed under Home Improvement. So who will get which rooms eventually? « Spring Break, Part 3 – Baseball!